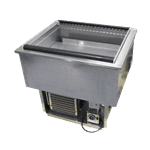 Perfect for caterers, cafeterias, salad bars, buffets and more, commercial drop-in cold pans help keep your cold food cold for longer. These cold pans are designed to nestle into your existing drop-in units to create a flush, insulated design to keep fresh veggies, fruits and more cool. It doesn’t matter if you’re looking for a high-quality replacement cold pan or for a full unit, CKitchen is always on hand to help you find the right style. We’re an authorized dealer of the best drop-in unit manufacturers, including Delfield, APW Wyott, Piper Products, Wells and more! Our selection includes a broad range of styles for every environment and budget. For the most cost-effective style, opt for an ice-cooled drop-in unit that’s portable and low-cost to operate. 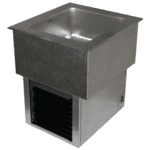 If you need something that’s more heavy-duty and low-maintenance, we recommend a drop-in cold rail or pan with a self-contained refrigerated system. For permanent buffets and self-serve setups, refrigerated drop-in pans are definitely the way to go. We even have some mechanically cooled drop-in pans that use forced air to keep food cool. These days, you can count on your drop-in refrigerated cold well to perform for longer while drawing less energy. Some styles are equipped with environmentally friendly insulation components that help ensure cold retention for longer periods of time. Most are constructed from stainless steel for extra cooling power and easy cleaning and sanitation. At CKitchen, we’re proud to offer an incredible range of drop-in units and pans with styles ranging from affordable replacement pans to large multi-compartment drop-in well units that can hold many different foods at once. All of these products come with free shipping and guaranteed low prices!